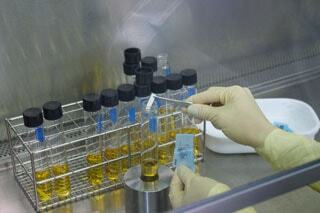 Biological Indicators (BIs) are widely used to monitor the efficacy of sterilization processes. BIs provide a high level of sterility assurance and are ideal monitors of the sterilization process. The BI Sterility test is performed on exposed BIs after completion of a sterilization load through either a validation or routine lot release monitoring. The test is qualitative which yields results of either growth or no growth of the appropriate indicator organism. The test is performed on BIs subjected to different types of sterilization such as ethylene oxide, steam, dry heat, vapor phase hydrogen peroxide and ozone, as well as other novel processes. Both traditional BIs and self-contained BIs may be tested. This test is typically performed during validation as well as during routine production as a lot release test. BI testing and sample requirements are outlined in numerous standards including USP <55>, the ANSI/AMMI/ISO 11138 series parts 1-4, ANSI/AAMI/ISO 14161, and ANSI/AAMI/ISO 11135. Nelson Labs offers BI testing 7 days a week, 365 days a year with no holiday or weekend fees. Samples are tested immediately upon arrival and the final reports are uploaded to our secure website the same day BIs are released from incubation by 10:30AM (MST) from Monday to Friday. In the Biological Indicator Sterility test, BIs are aseptically placed into soybean casein digest broth and incubated for the appropriate time and temperature, depending on the growth requirements for the indicator organism. The samples are typically incubated for 7 days at 30–35°C for Bacillus atrophaeus (EO or dry heat processes) or 55–60°C for Geobacillus stearothermophilus (steam or vaporized hydrogen peroxide processes). Other incubation conditions depend on the BI manufacturer’s instructions. Clients may perform testing for a shorter release time by following the FDA (CDRH) guidance for Spore Strip Reduced Incubation Time (RIT) validation. Nelson Labs performs reduced incubation time validations and can assist you in shortening incubation times in order to release a product to market sooner. Note: BIT210 is subject to a minimum test fee. See BIT710 above for pricing. Note: BIT230 is subject to a minimum test fee. See BIT715 above for pricing. If you have additional questions about Biological Indicators (BIs) Sterility test services, or would like to consult with the experts at Nelson Labs, just send us a request or call us at +1 (801) 290-7500.